During the Popular Assembly, called by Alvaro Noboa, he emphasized, as first point: “Never in the history of my political career, started in 1998, I’ve organized a Popular Assembly with 12.000 people attending from all the country’s provinces. I felt like a rock star”. On that day, 4 ecuadorians won prizes: a house, a car, an scholarship and a job in one of Grupo Noboa’s companies. Noboa is confident of passing to the second round in the presidential elections along with Rafael Correa. The President has 36% of the voting intention, and Noboa has 21%. The situation now is different from 2008, when Correa won the Popular Referendum. He has become a tyrant and the rejection for him is growing day by day. “Correa won’t win in the first round, and I´m sure will beat him in the second”. “I’m the candidate of the opposition, and everybody are going to join forces to remove him, democratically, from office. Political parties, teachers, students, public servers, policemen, military men, ecuadorians in general and that WILL BE NEWS WORLDWIDE”. OTTO SONNENHOLZNER: Good morning to Radio Tropicana audiences. Otto Sonnenholzner greets you, this morning. We’re going to start today’s program in the company of attorney Álvaro Noboa Pontón, businessman and director of the National Action for Institutional Renovation Party, PRIAN. A party that finds itself in the struggle to participate in the next elections and that finds itself in the process of the revision of signatures, which is public, and has citizens watching what is happening in the National Electoral Council. Counselor Noboa, welcome to Radio Tropicana, it’s a pleasure to talk with you this morning, good day. ÁLVARO NOBOA: Good morning, Otto, dear radio audiences, good day. In regards to the first commentary, I have good news. In the first count, we have already 50,000 signatures approved, and between Wednesday and Thursday, they will count 200,000 more signatures that we have submitted. Therefore, we think that of those 200,000 they will accept half, that will leave 100,000, plus the 50,000 already approved, which will be 150,000, which will be the party with the most affiliates in the country, and together with Alianza País, they will be the political institutions with the most affiliates. That is to confirm for the Ecuadorian people that my candidacy as well as my party forms the great opponent to Correa. What I say of my polls is true: 36% for Correa; 21% for Álvaro Noboa; 3% for Lasso, 2% for Lucio Gutíerrez; 2% for Alberto Acosta. Besides that, we have the best proof, the famous meat and bones survey. On Saturday we had an National Assembly in which I felt like a rock star because 12,000 people attended. In all of my political career since 1998, I’ve never had an assembly with 12,000 people. OTTO SONNENHOLZNER: Counselor Noboa, we had heard of what happened at the weekend at the Industrial Molinera on the day of the PRIAN Assembly. Tell us: What has changed in the electoral panorama? You are going to try for a fourth time to seek the Presidency of the Republic? What is different, in your view, from what happened in ’98, from what happened in 2002, from what happened in 2009 and today, in 2013? What has changed, Counselor Noboa? Ecuadorian people don’t need a lot to get tired of a leader, if we see that in Ecuador there have been leaders who have only lasted two years. Imagine it, six years of tyranny! The people are tired of it. Therefore, wherever I go, thanks to the amount of affiliations, thanks to the acceptance of my political proposal, they say to me: “Counselor, we are going to continue voting for you, as many times as it takes, until Ecuador finishes with being poor!” And that is what motivates me. It makes me continue in the struggle. I will reach the second electoral round. Whoever gets to the second round will win the elections, because there is more anti-Correa sentiment than pro-Correa sentiment, and that is going to be big world news. We will become part of the history of Ecuador as a country that, democratically, removed a tyrant from power. OTTO SONNENHOLZNER: Counselor Noboa, one of the things that has indeed changed in the legal aspect, has been the management of electoral control. In regards to publicity, you know that there is now a limit on the advertisement based on time periods submitted by the Electoral Council which complicates the transmission of a message a lot. You denounced it in those terms, based on your experience in 2009. Besides which, there are new norms, in the distribution of seats for Assembly Members a second round has been created. That is to say, the situation today means it is more difficult for there to be a second round. It’s very much easier to win in one round, which makes six years, and that was a change by the Rafael Correa government. Today, with 40% of the vote, and 10 percentage points more than the second- most voted for, there won’t be a second round in Ecuador. Counting on 40% of valid votes – and be careful, that is an important point – there being a second round, it will be easy to bring down Rafael Correa, but a lot has been said about there having to be unity among the opposition in Ecuador for there to be a second round. 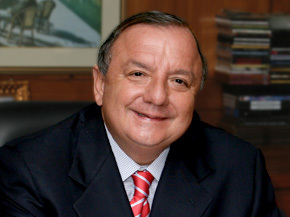 The left united behind the figure of Alberto Acosta. What about the rest, Counselor Noboa? ÁLVARO NOBOA: First, let me clarify that in 2006, Correa announced and they even made a song about it, “I’ll win in only one round,” and then he came in second behind me. So, don’t believe it is that easy to win in one single round. We’re no longer in 2009, after a Montecristi which gave Correa 80%, he still hadn‘t become a tyrant. Today, the people see him as a tyrant. 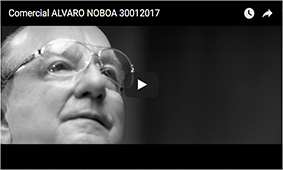 On the streets, they tell me: Counselor Álvaro Noboa, remove the tyrant from power. So he didn’t have that image in Montecristi in 2009, in the period of Montecristi where, YES, he did win in one single round. In 2006, the NO won in only one round and we believe that the same thing from 2006 is going to happen, where there is the possibility to get through, if he continues to fall and I continue to go up, to entering, myself first, into the second electoral round with a difference like in 2006. In the second round, all of the parties were with him, and the ones who are now against him are: the MPD, PRE, Pachakutik, Sociedad Patriótica, who allowed a free vote to their followers, so with him had been all the movements from the extreme left that today are aligned around Alberto Acosta. He’s going to have all that going against him in the second electoral round, because everyone is fighting for Correa’s exit. I believe that this election is not about who is going to be President, but rather about how to get Correa out democratically. That is terrible for Correa. He’s brought it on himself: I am one of the victims of the persecution. He’s used the IRS in whatever way he has wanted to. First, inventing a tax on profits that never existed, profits of 200 million dollars. Everyone who knows about business, or the banana business, where one earns 1% over total sales, I would have had to have sold 2 billion dollars worth and in that year, we sold 280 million; that same year, he puts Dole at $780,000 in taxes, Chiquita at $35,000 dollars. That debt persecution is to attack the candidate, to intimidate him, so that I won’t participate in this election, because if they know numbers, seeing that the PRIAN is the party with the biggest number of affiliates, it’s for him that they are going to vote. OTTO SONNENHOLZNER: I do want to talk about the tax issue in the final part of the interview. I believe it is a very interesting topic and as you have brought it up, I’d rather know directly about politics. ÁLVARO NOBOA: With regard to politics, I have invited Lucio Gutiérrez, he wants to be the presidential candidate. You tell me, Lucio doesn’t have any money and he has 2% of the vote. I am working with all the economic power that I can bring and I’m at 21%. Why would I cede the presidency to Lucio on this occasion? I’ve also looked to other parties, so that all of us get together. I have gone to see people from the extreme left wing. I have made offers to Lourdes Tibán to be my Vice-President and she said to me – Lourdes has prestige, she’s an intelligent woman – she told me “No,” that she’s going to be the first Assembly Member of her party. So I have made all the efforts within my power, and if the others for A or B reason don’t want to, they are free, in accordance with democracy, to do what they’d like. I think that Dalo Bucarám is a great, young political figure. Dalo, in many ways is better than his father, and that’s what every father wants. I want my children – and there’s a lot of them – my daughter Carla, is the first, my son Daniel, my son Juan, my son Santiago – in many ways they outstrip me. Dalo is a very good figure. Dalo, if he had the right age, would be an excellent presidential candidate. So I also look for people like Dalo, like his wife, who is politically respected. That is what I can tell you, that, yes, I have gone looking for them, that I am going after them and won’t stop looking for them. OTTO SONNENHOLZNER: Fine, we are talking with Counselor Álvaro Noboa Pontón – I understand – the PRIAN candidate for President of the Republic. That still needs to be formalized, but I understand that a huge meeting that took place in the Molinera, Counselor Noboa, you said: “More than 12,000 people.” So it was a massive audience, so your candidacy is practically confirmed. ÁLVARO NOBOA: That’s right. And I would also like to ask radio listeners to look at the newspapers. When has Lasso, when has Lucio, or Rafael Correa himself been able to bring together 12,000 people this last year? Rafael Correa, first there’s 200 policeman surrounding him when he arrives – a bad image, the image of a tyrant –then a few public employees and government employees turn up, because he is the biggest employer in the country. I am the biggest employer in the private sector, but the government is the biggest employer on the national level. They stick a couple of public employees there, and they hold their assemblies with them, against the 12,000 people from the 24 provinces because we held raffles in line with my ideology. My ideology is that everyone should become part of a middle class country, that the poor should disappear as poor people and to become part of the wealthy or middle classes, with a cement house, with a car, with a scholarship, with a university-degree profession and with honorable work. That day we gave away four things: we raffled a house, we raffled a car, we raffled a university scholarship and we gave a job to one of the winners. The car was driven away by a man from Ambato; the house was won by a man in Guayaquil, the scholarship, as I understand it, was won by a woman in Manabí. So, present there from all over the country, were young people, who were also very visible there, because I have said that half of the Assembly should be young. Why? Because half of Ecuadorians are young and, therefore, Dalo is a new figure, a young figure, and we are going to bring these young people to the Assembly. Hopefully, the other parties will do so as well. The young are the hardest hit. That woman who won the job said, “I’ve just completed some time at university, but nobody gives me work.” So, just imagine it: the parents have made an effort, the student has made an effort, scholarships, they finish university, and don’t get work. There are many complaints with respect to the economic issues, to the issue of security. OTTO SONNENHOLZNER: Counselor Noboa, how is your party with regard to the leaders who were very symbolic to the PRIAN, that today are no longer with you, beginning, among them, with Vicente Taiano by way of Wladimir Vargas. ÁLVARO NOBOA: We held the Assembly with great pride and at the end of the Assembly called all the Provincial Directors – I’ve got some good news for you: all of them were there. Or, that is to say, the efforts Vicente made to try to steal away Directors was in vain, because we had 24 Directors from the 24 provinces. Vicente wasn’t even a Provincial Director, he was a National Director, he was therefore one of my best figures. He was candidate for Vice-President in 2006. The red shirt looks horrible on him; it’s as if tomorrow an Ecuadorian soldier were to put on the uniform of another country. He’ll think it over again, and from there to Wladimir Vargas who I threw out for having held up the Press. Because he veered off in order to support Correa in regards to putting a gag rule on the Press, and he was warned. He spoke to me, he told me that he wasn’t going to do it, and finally he did do it, and you’re out! So the Press looks at our party with amazement, which is ready to expel an Assembly Member who is against the Press. OTTO SONNENHOLZNER: Counselor Noboa, you denounced, at one time, certain medias for not attending to you. They wouldn’t have you, and it appears that those medias do receive you. ÁLVARO NOBOA: All of them. I am very grateful to Ecuavisa; I am very grateful to the newspaper Extra; I am very grateful to the newspaper Expreso; to El Universo; to El Comercio; to RTS, to Teleamazonas; to RTU, to Telerama, and even the government media — Gamavision and TC – they bring out news that is somewhat edited, to put it elegantly— Listen, every convocation that I put out, in full in the marvelous radio stations like your own: Radio Sucre, Radio Tarqui, Radio Colón, Sonorama, CRE. We are holding interviews almost daily. I believe that you, Mr. Sonnenholzner, who is in the business, is aware that I speak every day. Now it’s the new Álvaro Noboa who speaks almost every day in the radio. OTTO SONNENHOLZNER: Counselor, but to what is this change due, both of the media and of yourself? Before you were very reluctant to give interviews. ÁLVARO NOBOA: I’ve matured. I matured a little late, but as I am planning to live to 150, I’m in the middle of my youth. OTTO SONNENHOLZNER: Counselor Noboa, let’s move to the business issue. You are one of the principal businessmen in the country. You have this problem with the IRS, and I am concerned because we are all small or large businessmen. I’m referring to what seems a disproportion in regards to what they are demanding in the audit of Exportadora Bananera Noboa. Are there things that still need analyzing here, is there an antecedent in regards to the payment of taxes on income versus billing in these kinds of businesses, like the business of banana exports? ÁLVARO NOBOA: It’s the 1%, if you invest two hundred and some million dollars, you normally pay two hundred and something. That implies a return of 4% which is high. OTTO SONNENHOLZNER: Let’s speak of the year 2005, which is the problem year. ÁLVARO NOBOA: We paid then on sales of $250,000,000, so we paid 1%. Therefore that implied that the return had been around 4% over sales. Imagine it, they’ve imposed a tax on me of $49,000,000. That would be saying that the returns were $240,000,000 or that we had a return of 150% on sales. That is to say, we earned more than we sold. That wouldn’t make sense to any accountant and if the radio listeners are accountants, they will know that this simply doesn’t exist in accounting. How could your radio bill out $5,000,000 and have earnings of $7,000,000? There’s no way. OTTO SONNENHOLZNER: And accepting the audit would mean that it would have a domino effect on the following years. ÁLVARO NOBOA: Exactly. How intelligent, Don Otto. It’s not just a problem of the company not having to pay the $49,000,000. It’s that the company doesn’t have the money to pay and it would go into bankruptcy. What’s more, the day we let our arm be twisted, or because they twist it by force, that will be the year that a hundred will go down and then two hundred, until they liquefy the entire Grupo Noboa. OTTO SONNENHOLZNER: Now, how have you experienced the judicial occasions, Counselor Noboa? ÁLVARO NOBOA: Well, we have lived through the greatest injustices. First off, it sounds like Ripley. We still aren’t able to litigate. They won’t allow us to take it to court, because the Constitutional Tribunal said: take it to court and you have 15 days to submit the guarantee. We submitted the guarantee temporarily, and it wasn’t possible for there to be a hearing. There is a legal principle – I don’t know Otto, if you are a lawyer, I am – that says: that for reasons of formality justice must be served, so we submitted the guarantee and there it is. So then the judge has no other option but to say that it is a formal problem, but the guarantee is already in place, and they proceed to do justice, but according to our lawyers, we submitted the guarantee within the time limit specified by the Constitutional Tribunal. Each time that a judge finds in our favor in a ruling, or in an instance, they put him in jail. That’s where Judge Posligua is, the poor prisoner. And the one who finds for the Government is given awards, they promote him, they send him to the Superior Courts, the give him the best privileges, protection, etc., etc. Well what this all says is that justice in Ecuador is finished, and look, that is no different, because I have followed it closely and I am on the side of El Universo, and not on Correa’s side: every time that a judge found in favor of El Universo in a ruling, in a decision, or in any element of the case, they fired him, the chastised him, they did everything to him. OTTO SONNENHOLZNER: Counselor Noboa, there is on issue in the judicial area with regards to that audit. Firstly, it’s not the only audit against Grupo Noboa, I understand. ÁLVARO NOBOA: No, no, it’s not the only audit but it is the most exaggerated, that we see it’s not worth the effort fighting. Also lawyers charge a lot, and it’s better sometimes to pay it rather than to pay the lawyers the thousands or tens of hundreds of thousand dollars we have paid to defend ourselves. OTTO SONNENHOLZNER: You have initiated a court case. Why not seek international defense? Are you going to present your case to the Inter-American Court of Human Rights? I’ll ask the following and it is based on the experience with the Grupo Isaías, where there supposedly were debts, cases that still aren’t concluded, seizures, and well, other measures. The IRS has said that they can actually take action against the personal wealth of Álvaro Noboa. You say that you have nothing in relation, as a link, etc. How do you see this? ÁLVARO NOBOA: Let me talk about not having anything. It’s not to make fun of the people, nor the Government of Ecuador. Large businessmen throughout the world, when they see that over the years, decide to, while they are still alive, to donate, through trusteeships to foundations, etc, etc. – which is not necessarily my case, but just as an example, not just as my version – they donate their wealth, like Bill Gates did, the wealthiest man in the United States; like Warren Buffet did; like Barón Von Thyssen did, a European who died and left his most important art work to his wife Cervera and his children. Well, then, it’s also given to foundations, etc., etc., and those foundations can have the Red Cross as a beneficiary, that trusteeship could have an employee as a beneficiary. And that’s what a lot of businessmen have done who leave employees as inheritors, so that from then on those ownings are not mine and the trusteeships of those ownings do not allow me to take that money because that would be a joke, because my father left me trusts, because my father left ownings in trust in such and such institution. There is the Rockefeller Foundation. In English they call it a Trust. It’s not unusual for that to take place among wealthy people. On what do we live afterwards? We ourselves take this decision with a salary. Until his death, Baron Von Thyssen had an important salary. I have a salary of more than $2 million dollars. The biggest individual taxpayer and Grupo Noboa, when you put together the hundred and some businesses is one of the 10 Ecuadorian groups that pay the most taxes in the country. Carlos Marx says: “If that man doesn’t pay taxes…” First he has to tell the truth to the country. As an individual tax payer, I pay more than the Eljuris, I pay more than Fidel Egas, I pay more than my sister Isabel Noboa, who is known to be very wealthy, and many other important people in the country who are known to be wealthy. In Grupo, it paid much more than the majority of groups. I am among the top ten taxpaying groups. When you put together all the taxes that each of the companies has paid – besides which, the business pay taxes throughout the world: in the United States, they pay taxes in Japan, they pay taxes in Italy, they pay taxes in Belgium, they pay taxes in Croatia, they pay taxes in New Zealand, that also needs to be added, because we have companies throughout the world and therefore we have to pay taxes in those countries. OTTO SONNENHOLZNER: Counselor Noboa, thank you very much for having talked with us this morning in Radio Tropicana, it’s a pleasure. ÁLVARO NOBOA: It’s been one of the best interviews that I have had, thanks to your intelligence, your ability, and the great radio station you direct. OTTO SONNENHOLZNER: Thank you very much, Counselor Noboa. Greetings. ÁLVARO NOBOA: Thank you very much and to your radio listeners.